You don’t have to go to Disney World to know that it’s a small world. 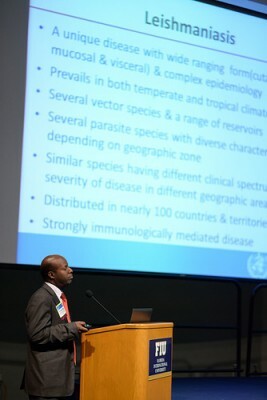 Tropical disease experts from around the world gathered at the 4th International Tropical Medicine Conference at FIU to talk about the real-life small world of tiny parasites, bacteria, viruses and other germs wreaking havoc around the globe. The annual forum was held Feb. 26-28 at the Graham Center Ballrooms and sponsored by the Herbert Wertheim College of Medicine. Under the microscope, many of these microbes look like miniature monsters and have ugly names like schistosomiasis and leishmaniasis, which fittingly match the horrible diseases they cause. They are virulent bugs more than willing to take advantage of the age of global trade and travel to spread their scourge. Take Chagas disease, caused by a parasite transmitted by so-called “kissing bugs.” It can cause heart damage and can be fatal if not treated. “Formerly restricted to poor rural areas of Latin America, Human Chagas Disease became progressively a social problem in urban areas all over the world as a clear result of the universal process of globalization and international migration,” said presenter João Carlos Pinto Dias, M.D., of the René Rachou Research Centre (Fiocruz) in Brazil. Daniel Argaw Dagne, M.D., a medical officer with the World Health Organization (WHO) in Geneva, Switzerland, spoke about the globalization of leishmaniasis, another vector-borne disease caused by a parasite transmitted by sand flies. According to the Centers for Disease Control and Prevention, “almost all of the cases of leishmaniasis diagnosed in the United States are in people who became infected while traveling or living in other countries.” Such was the case of Marguerite Higgins, the Pulitzer Prize-winning journalist who died in 1965 after contracting leishmaniasis while covering the Vietnam War. Just because leishmaniasis is not a problem here, local experts warn we must still be vigilant. “In the past month I’ve had two cases of doctors in Miami-Dade who contacted us on how to handle patients who had traveled to endemic areas and had symptoms of cutaneous leishmaniasis,” said attendee Alvaro Mejia-Echeverry, M.D., an epidemiologist with the Florida Department of Health in Miami-Dade. Dengue is another case in point. Dengue fever, a viral infection transmitted by mosquito, was a geographically restricted disease until the middle of the 20th century. “War, economic changes, global trade, and modern technology have led to a massive increase in travel over the last decade, including travel to places where dengue is highly endemic“ said Aileen Marty, M.D., professor of infectious diseases at the FIU HWCOM. She described the data on the origin of dengue virus, the mechanism of its worldwide spread, and how the Dengue type 1 virus from Nicaragua became the Key West Dengue type 1 virus. But there was also positive news from the conference. Michael Daly, a professor with Uniformed Services University of the Health Sciences, outlined a radical new way to create vaccines. He has found a special peptide inside an “extreme” bacterium that allows the removal of genetic material from viruses, bacteria or parasites leaving intact those aspects that stimulate our immune system to form protective antibodies against the germs. In addition, there are at least five dengue vaccines in commercial development and international immunization experts report that countries in the Americas are adopting new vaccines like the pneumococcal vaccine, the rotavirus vaccine and the human papillomavirus vaccine at an accelerated pace with encouraging results. Still, globalization remains a key factor in the spread and control of tropical diseases as we are reminded that it is a small world after all.